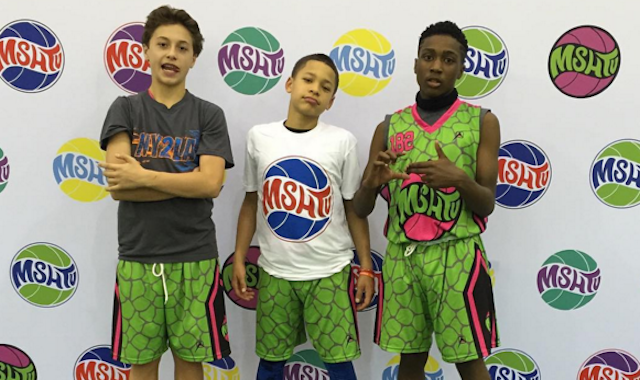 For Class of 2020 sharpshooting point guard Vincent Gonzales (middle), his relentless work ethic is paying off. Gonzales has been receiving national attention and has even been ranked in the top 50 of his class. The Peterson School 8th grader plays AAU for Team Flight and has just completed an impressive showing at the MiddleSchoolHoops Showcase this past weekend in Indianapolis. In addition to the MSHTV Showcase, Gonzales plans on testing himself against the top competition at the John Lucas Camp and Jr Hoops Elite Camp in the coming months. Gonzales, from Chicago, plays an aggressive, attacking style of basketball. It’s no surprise he models his game after NBA stars Derrick Rose and Steph Curry. He can get to the basket with the dribble, but what makes him hard to guard is his outstanding long-range jumper. While his shot can be a little streaky (an aspect of his game he will be working on), Gonzales uses this to keep defenders honest and on their heels. Gonzales will be releasing his first highlight tape in a week or two, but in the meantime check his game out on Instagram @Gonzales.18.